Suggestions of corruption at FIFA are nothing new. It’s been well known for years that millions of dollars have changed hands between the mighty football organisation and sponsors, governments and powerful individuals. However, it’s always been something that was known about but not spoken of, the inevitable side effect of having such a large and influential organisation at the heart of the world’s most popular game. Now, with the arrests of several FIFA execs and the resignation of Sepp Blatter, it is apparent that even the mightiest corporations can fall. FIFA has, in the minds of many, been associated with enormous wealth, lucrative sponsorship deals and a popular game. But if it emerges that FIFA has given the World Cup to countries that may not be able to sustain it accusations that there has been too much emphasis on the profit of football rather than the game itself may start to ring true. ‘It’s only a game’ they say, but it’s been a game of cat and mouse for the FBI, Swiss investigators and the alleged wrongdoers at FIFA. It was astonishing to many of us that after the arrests that Blatter was once again elected as the FIFA president. Finally, those accused of corruption must answer for their actions and if found guilty take responsibility for running the game in the interests of the highest bidder. Nobody in England is in doubt that this country was robbed of the 2018 World Cup in favour of ‘corrupt’ Russia, but we may not be the most unbiased arbiters here. It seemed ridiculous at the time, when the UK is already host to stadiums with large capacities and football teams known about and supported the world over. To the casual English observer (and many less biased onlookers) it appeared that the home of Manchester United, Chelsea and Arsenal had been robbed of the chance to bring football ‘home’ simply because Russia could pay more. However, one must now begin to question not only the morals of bowing to corruption and power, but also the human cost that comes from it. The 2022 World Cup was assigned to Qatar, a country that is far too hot to host a summer football event and one that is in no way equipped for a sporting event on such a grand scale. Tourists will descend on Qatar, demanding alcohol in a dry state, and proving to the world that football hooligans and Qatar perhaps are best kept apart. That is not the worst of it, though. It emerged that last year, a construction worker died every other day on the building sites in Qatar. How has FIFA been able to ignore this unimaginable failure of humanity? Whether those arrested are found guilty is still to be decided, but one hopes that FIFA can be reformed. If nothing else the revelations of potential corruption suggest that FIFA’s internal workings are extremely old fashioned and display to the world the worst face of capitalism. But FIFA is far from the only big organisation out there that needs to be reformed. The Anglo-American form of capitalism may have had its day if recent banking and other corruption scandals are anything to go by. Once Blatter has left, the organisation must ensure that it takes steps to distance itself from its past. One way of doing this might be to embrace a new approach to business where benefits besides financial gain are given weighting in the decision-making process and where the wealth of the football community at large is prioritised ahead of the profits of a few very rich investors. Capitalism the way we know it almost inevitably leads to the few profiting at the expense of the many, but it doesn’t have to be this way as smaller movements around the globe, such as crowdfunding, the Conscious Capitalism movement and the Cambridge Phenomenon are proving. Big businesses the world over can learn valuable lessons from such organisations. Introduce a levy on players and football is fun again. Football is getting less exciting. In many leagues and tournaments competitive balance is decreasing. For instance, only few clubs still have a chance to win the Champions League, and Ajax is no longer among them. In addition, the status and therefore the attractiveness of the leagues of small countries is waning in the long run because of the outflow of talent, and this also holds for the Dutch Eredivisie. Of course, a boy from Amsterdam can support of Barcelona so that he can see the club of his dreams win the important Spanish title, or the Champions League. But he sacrifices his chance to see his club win in a football stadium. Barcelona is far away, and CampNou has only 99,000 seats. The boy will cheer before the television, possibly alone because his friend next door is an Arsenal fan. In the meantime tickets are getting more expensive, and viewers now pay to watch matches that used to be free. In the Netherlands, things are not like this yet. However, the cheapest season ticket for Arsenal is a staggering €1250. Football is getting less accessible for the average fan. How do our politicians react to this? They let it go. If the Dutch government takes a measure which significantly harms big firms – such as a high old-fashioned tax on profits – many firms will move abroad. But football is different. The biggest clubs are all located within the European Union. And it will remain that way. Arsenal cannot move to New York, because it will lose almost all its fan. And therefore the European Union has, in principle, power over the clubs. It should use that power now. I propose a progressive social levy. This means that a club like Arsenal should spend one euro on special projects for every euro it spends on players’ salaries. For example, projects to reduce the rate of school dropouts, or to support non-professional clubs. The downside to this is that the levy will force Arsenal to spend less on players, which will weaken its squad. Feyenoord Rotterdam adopts this sort of business model: for every euro the club pays out on player salaries, it has to spend 20 cents on social projects. For a small Dutch club like Cambuur the figure is five cents, so that Cambuur can pay its players almost the same salaries as before. So, Cambuur stands a better chance against Feyenoord, and Feyenoord can score more goals against Arsenal. This is also an advantage because Feyenoord’s monumental stadium, De Kuip, has a much better atmosphere than Arsenal’s expensive Emirates Stadium, making victory for the fans even sweeter. But can the football sector really afford to divert large sums of money to social projects? The answer is simply, yes, it can. The average club in the English Premier League, for instance, now earns 53 times as much as the average club in the English top division of 1960 (after adjusting profits for inflation). Elsewhere in Europe, football has also seen remarkable growth. The exploding revenues have mainly been used to pay players higher salaries. Now, because the levy is directly based on the players’ payroll, the players will earn less so that no club needs to go bankrupt. Because the levy is highest for the largest clubs, it is the top players like Steven Gerrard and Wayne Rooney that will feel the effect of this business model most harshly. But they can still become millionaires. What we need is to restore balance to the competition and not restrict victories to whichever club has the most money to spend on players. At the same time, more money will be available for social projects. Too idealistic? From an economic view certainly not. But is the proposal politically feasible? We are talking about a policy that harms vested interests and that can only be successful after a hard political battle which can take many years. So the question is whether there are politicians who want to fight for the fans. Or will politicians rather prefer to let the football fans walk alone? One thing is certain: the extent to which football remains attractive will depend on politicians. If you’ve grown up in the UK then you’ll know the passion that we have for our home teams. Football has become the unofficial national sport of this country and fans flock in their thousands to each game, cheering on their teams come rain or shine. This afternoon, Dan Walker and Sarah Brett will discuss the rising price of football on BBC 5 Live. It will be interesting to see what they make of the rise in costs and whether they believe they are spread fairly. Despite the recent recession the costs associated with supporting a football team continue to rise. Many people across Britain are now having to pay high sums to attend games. This, however, is not the end of the cost. Think about away games, travelling to different stadiums, buying the new season’s strip, and a pie at half time. All these expenses add up; football starts to look like that cute puppy you adopted but who turned out to be a Great Dane, eating you out of house and home. Economist Tsjalle van der Burg points out that even if fans decide to stay at home and avoid the ridiculous cost of a season ticket, they still have to pay high prices to watch the matches on TV. So where does all this money go? In Van der Burg’s book, Football business: how markets are breaking the beautiful game, he highlights the effect that money has had on the sport. What would have happened if Manchester United, the English champions of 2013, had played Burnley, the champions of 1960? The answer is clear: the Mancunians would have beaten the Clarets 158–1. That is, if the score had been expressed in terms of money. The Clarets made £136,000 in 1960 (or, to be precise, in the season ending that year). In that year £1 bought you seventeen times as much as it would in 2013. So £136,000 in 1960 was worth as much as £2.3 million in 2013. However, Manchester United earned £363 million that year, in other words 158 times as much. The other English clubs were earning less than United in 2013. However, the average Premier League club received, after correcting for inflation, about fifty-three times as much as the average club in the English top division of 1960. Not a bad score. Elsewhere in Europe, professional football has also seen remarkable growth. It all seems to be a great success. But is it? The revenues of car manufacturers have also exploded since 1960. Consumers spend much more on cars than they used to and they get a lot in return: a wide choice of cars is produced and the cars are of superior quality. One could assume that the same thing is going on in football, when in fact, the quality of the basic product – football matches – have not improved over the years. There is more and more money in football, and this has changed the character of the game. Everything has become more business oriented. Supporters have to pay more to watch matches. The distance between clubs and their supporters has grown. Some clubs are owned by entrepreneurs in search of profits. And these trends seem set to continue into the future. Some see the money in the game today as a curse. They yearn for the past when ‘everything was better’. Is football too expensive for the fans? What would happen if the EU introduced a ban on pay TV for all live matches and highlights shown in EU countries, so that they became free again? A ban would naturally mean that broadcasters would make less money. Therefore, they would pay the clubs less for their broadcasting rights. So the clubs would earn less and would have to moderate their expenditure. They could easily do this by paying the players less so that, on balance, clubs would not be disadvantaged. In the days before pay TV, clubs basically broke even, with lower income and lower expenditure and George Best producing beautiful play. So a pay-TV ban is perfectly possible. Indeed, because there is surplus money in the sector – more money than is needed for it to function as it should – a pay-TV ban will not harm the game. But how would TV stations finance the broadcasts? That’s simple: they would use the revenue from commercials. In the Netherlands, where many football matches are still available free of charge, the highlights of matches in the second professional league have been broadcast free-to-air for many years by a private company. The league is not extremely popular, with an average match attendance of about 4,000. This means that advertising can generate sufficient revenue for broadcasting all football matches which are at least as important as those of the second Dutch level. So we would be able to have a pay-TV ban for all these broadcasts while being sure they will remain on the air. Additionally, this also means there is no need for broadcasters to use taxpayers’ money to show football matches. So it is possible to have a pay-TV ban for all important football matches. Indeed, there is only one drawback: players (and coaches) would earn less. The benefits of a pay-TV ban would be considerable. The first advantage concerns the football fans who would watch the broadcasts anyway: they would get them for free. Their savings would be more or less equal to what the players (and coaches) would lose through reduced salaries. If the savings for those fans were the only advantage of the ban, the question of whether we should have a ban would be a question of fairness only. But the ban also has another advantage. This concerns football fans who do not watch (certain) football matches on pay TV because the subscription fee is simply too high for them. These fans will watch the broadcasts if they are free, because football gives them pleasure. For these people, a pay-TV ban would mean more pleasure. At the same time, the broadcasters’ costs would not rise when more people turned on their television sets to watch football. So with a pay-TV ban we get more pleasure without any extra costs. This means that on balance the net effect is that the football community would be better off. It’s transfer deadline day. Now that the world cup is over, the Premiership Autumn season is beginning.We’ve already heard about Balotelli’s move to Liverpool, Sanchez to Arsenal and Diego Costa to Chelsea. The English teams’ injection of European talent will undoubtedly shake up the football season over the next few months. Until midnight tonight, fans will be refreshing twitter and glued to Sky Sports News to keep up to date with the latest changes, panic buys and assess Harry Redknap’s coping techniques. Such is the importance of the premier league to the fans. Emotional, not to mention financial, investment in teams and payers is huge. The transfer fees spent on these top players sound like monopoly money to the majority of us, but why are the sums involved so huge? In his new book, Football business, Tsjalle Van Der Burg looks back at the reasons transfer fees are so high, and why clubs are in such a rush to sell off their players before their contracts expire. Jean-Marc Bosman was a player with Belgian club RC Liège. In 1990 his contract expired and he wanted to move to the French club Dunkerque. However, he was unable to do so because Liège demanded too high a transfer fee. Bosman took his club to court. The case eventually went to the European Court of Justice, the highest court of the EU. Bosman invoked the principle of free movement of workers, which had been part of European law since 1957. In 1995, after five years of legal struggle, the Court vindicated Bosman: it ruled that players whose contracts had expired could move clubs on free transfers. This ruling will remain in force as long as European law is not amended. The ruling has not only affected out-of-contract players; it has also had a moderating effect on the transfer sums paid for players with ongoing contracts. The reason is that clubs feel pressure to sell a player at a relatively early stage, for fear that he will otherwise leave on a free transfer. To be clear: this is not to say that the total of all transfer fees has fallen since 1995. On the contrary, it has risen. But that is because all the clubs now have more money than they did in 1995. However, total transfer fees would have been higher still if there had been no Bosman ruling. The ruling has ensured that the big clubs can more easily lure good players away from the small clubs. As a result, the most talented players tend to move to the big clubs at a younger age. The ruling hits the poor clubs hardest; they receive less money from transfers than would have been the case without the ruling. This makes it hard for those clubs to maintain the quality of their sides, because they need a lot of money to pay today’s high player wages. Sometimes clubs overcome the problem of the Bosman ruling with long-term contracts. But these can also work to their disadvantage: if a player fails to fulfil his promise his club may nevertheless have to continue paying his wages for years. All in all, the ruling has weakened the transfer system and it has added to the competitive inequality. Since 1995 there have been some other, smaller changes in the transfer system as a result of pressure from the EU. For instance, the EU, FIFA and UEFA have agreed that the duration of a contract should be a maximum of five years. It has also been agreed that contracts have to be protected for a period of three years for players up to the age of twenty-eight, and two years for older players. Until now this rule has had little practical effect due to its vagueness; it is not clear exactly what the legal rights of club and player are when a player has served three years of a five-year contract, or two years if he is an older player. However, it is possible that, in such cases, the maximum transfer fee will become equal to the salary the player would have earned in the remaining years of his contract. This will have a downward effect on transfer fees, and so football will become a bit less competitive still, thanks to the EU. It is debatable whether the contracts involved are really worth what’s paid for them, and Van der Burg would argue that football has not necessarily been made more exciting or competitive as a result of the massive amounts of cash now spent by clubs. What is clear is that, come midnight tonight, in the final frenzy of buying and selling, there will be new and exciting players waiting to shake up the premiership and make for another thrilling season. Players’ whopping wages, ludicrous transfer fees, and escalating ticket prices frequently hit the headlines when it comes to football. 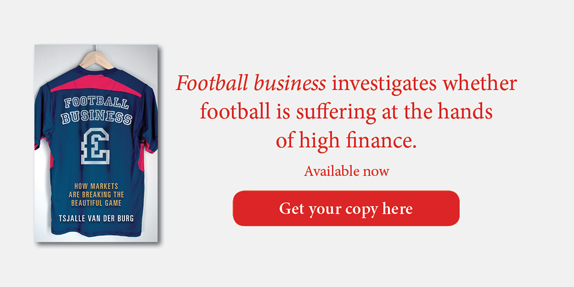 But there is far more to football’s finances than this, claims Tsjalle van der Burg, author of Football business. Football business will be available to buy from 1st September 2014, transfer deadline day. The book shows how the economics of European football have developed to the point where the structure of the business of football is now at odds with the game itself and the fans it was originally created for. An economist at the University of Twente in the Netherlands and a football enthusiast, Van der Burg exposes the hidden face of football’s finances and shows how the economics of this beautiful game have gradually taken it out of the reach of enthusiasts and into the hands of entrepreneurs. In Football business, he unveils the key forces at play in today’s most followed sport and points an accusatory finger at commercialism and greed, which have come to shape the current nature of the game. In a series of engaging and topical stories, van der Burg rattles the cage of football and gradually exposes the inequalities of the current system; he brings to light the weaknesses of UEFA’s Financial Fair Play (FFP) rules, takes a stand against pay TV and reveals how, in a global market for sponsorship and television rights, the competition amongst clubs is fiercer off the pitch than on it. His criticism of players’ inflated salaries is underpinned by solid economic principles, which expose the gap between their financial worth and their astronomical wages. At the centre of the book is Van der Burg’s desire for a redemption of the game; his call for a lowering of footballers’ pay and a redistribution of the surplus in the community is as much animated by philanthropy as by his passion for football. Van der Burg’s plea for a prompt rectification of European football’s off the pitch rules takes centre stage in the latter part of the book. A ‘robust system of financial control’ to bring football back to its most honourable days must be introduced, argues van der Burg. While ‘many things are wrong with the EU’ he adds, ‘it’s the only body with the power to bring football back to the people.’ But whether the EU will be willing to revive football’s honour is still uncertain. ‘Will the fans walk alone’, asks the author? The answer, he suggests, depends very much on whether those in control are prepared to depart from their current path. Dr Tsjalle van der Burg teaches economics at the University of Twente in the Netherlands. He has a special interest in popularizing economics and has published on economic subjects in national newspapers and spoken on radio and television. Van der Burg is a lifetime supporter of Feyenoord.